Currently viewing the tag: "K2"
I just replaced my trusty but annoying 3AA Maglite with the incandescent bulb and twist-on lens. I’ve never been too much of a Maglite fan, but it’s hard to argue with the sheer number of them out there. They work, but now there’s a new hotness in my roll cab’s top drawer. 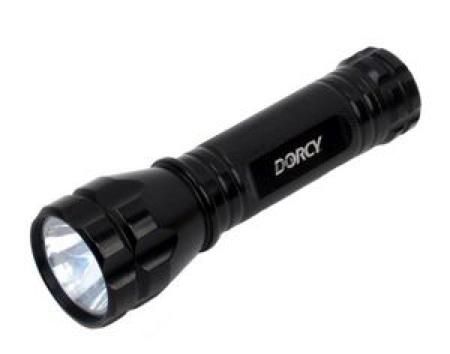 It’s Dorcy’s 160-lumen, 3AA K2, model number 41-4297. I’ve had it for about six hours, and I have no idea why the switch took me so bloody long. It’s a pocket rocket; I’d swear it’s brighter than a lot of car headlights. At about 5″ long, it’s pretty compact, though the flared lens housing makes it a little uncomfortable in one’s pocket. It’s a small price to pay, though, for swapping my peashooter for a tactical nuke. The switch on the rear is translucent, showing a battery status light that stays green until the battery life drops below 20%, then it switches to red.